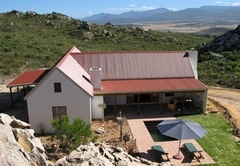 Petersfield Mountain Cottages is a highly recommended property providing self catering in Citrusdal for tourists visiting the Cederberg region. 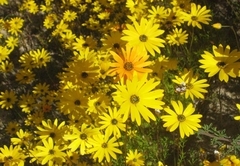 Petersfield is a working citrus and Rooibos tea farm overlooking the town of Citrusdal in the Cederberg area. Situated 170 km from Cape Town on the N7 it takes only one hour and forty-five minutes to reach Petersfield. 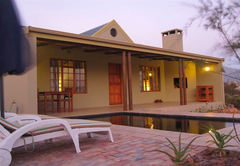 The farm is situated only five kilometers from Citrusdal so it is very convenient for guests to nip into town for shopping or to sample fare from some of the fourteen restaurants and coffee shops on offer. Citrusdal is towered over by the mighty Cederberg Mountains and is the closet town to that wilderness area where guests can hike and view ancient rock art. There are four mountain cottages on Petersfield, all set extremely privately in a 2000-hectare wilderness reserve of pristine fynbos and still teeming with indigenous wildlife. A lovely wooden cottage set under a thicket of oak trees next to a mountain stream. 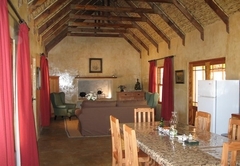 Dassieklip has two bedrooms and with the sleeper couch in the sitting room it can accommodate up to 6 guests. Outside there is a carport, an undercover stoep for dining and a built in braai area. The garden is dominated by an avenue of massive oaks trees and also boasts a private sparkling blue plunge pool. Dassieklip has luxuries like air-conditioning, M-net, CD player, microwave, etc. Very close by there is San rock art which can be viewed by appointment. Two kilometers into the heart of the mountain and tucked away in a secret basin is De Kom cottage. It has a commanding view of a citrus orchard and is flanked by sandstone cliffs in front. De Kom has two bedrooms and a sleeper couch to accommodate 6 guests. Double French doors lead onto the veranda for outdoor dining next to the private plunge pool and braai area. 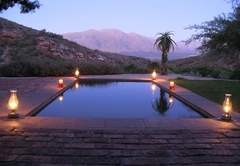 From the pool the breathtaking view is down the valley and onto the impressive Cederberg Mountains. De Kom is gas operated and well appointed with fridge, geyser, and oven. Lamps and battery charged lamps provide lighting. This cottage’s romantic ambience is enhanced by its very remoteness and is ideal for guests who want to experience total privacy. 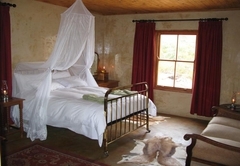 A kilometer from the farmhouse is our biggest self-catering cottage, ‘Die Veepos’, built in a Cape vernacular style. 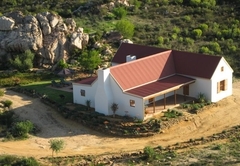 It is totally privately set in its own hidden valley amongst the sandstone outcrops and fynbos. It boasts three large bedrooms, a bathroom with shower and bath, lounge and kitchen. 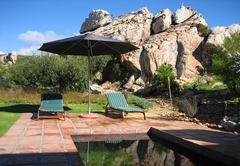 Outside on the stoep it has a plunge pool and under a nearby rock outcrop there is a shower to cool you off. 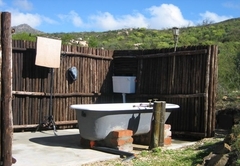 ‘Die Veepos’ also has a romantic outside bathroom privately set in the bush! Guests can enjoy bathing in an old Victorian bath under the stars, champagne in hand! ‘Die Veepos’ is also gas operated for ambience and a green footprint. Stonehaven is set very high up in the mountains, designed to accommodate a couple. The accent is on romance and privacy, all offered with a spectacular view of the mountains and the valley below. Stonehaven’s lighting and fridge will be solar powered. 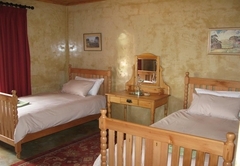 Inside the cottage is intimate and cozy with an open plan lay out which on the queen size brass bed. In the corner there is a raised double bath to be enjoyed by candlelight whilst enjoying the views down into the valley below. There is a separate bathroom for convenience and also a romantic Victorian bath in the veldt for a decadent way to end the day! The splash pool on the same level as the front veranda affords respite from the summer heat, the cool mountain breeze will ensure that guests sleep in absolute comfort. Guests come to Petersfield to totally unwind and to get away from the crowds. 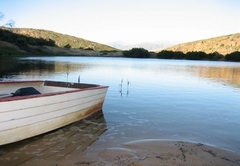 Here you are close to nature and guests are encouraged to hike in our mountains, swim in and row on the farm dam, which is high up in the mountains. There is a 4x4 trail for guests only so that some of the remote areas of the reserve can be visited. For the more energetic, bring your mountain bike and explore our world! For the rest of us ... bring along great food, dine under the stars, or just laze by the pool, relax, read and unwind in total isolation! We are also a pet friendly establishment so we welcome guests to bring their pets along on holiday with them so that they also can enjoy the absolute freedom, tranquility and space that makes Petersfield so special. All dog breeds and cats are welcome at all four cottages. Pets stay FREE and no doggie damage deposit is required. A lovely wooden cottage set under a thicket of oak trees next to a mountain stream. 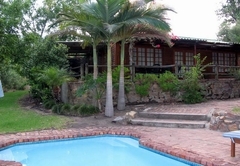 Dassieklip has two bedrooms and with the sleeper couch in the sitting room it can accommodate up to 6 guests. Outside there is a carport, an undercover stoep for dining and a built in braai area. The garden is dominated by an avenue of massive oaks trees and also boasts a private sparkling blue plunge pool. Dassieklip has luxuries like air-conditioning, M-net, CD player, microwave, etc. Very close by there is San rock art which can be viewed by appointment. 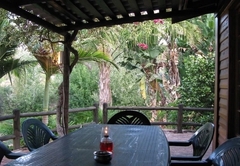 Two kilometers into the heart of the mountain and tucked away in a secret basin is De Kom cottage. It has a commanding view of a citrus orchard and is flanked by sandstone cliffs in front. De Kom has two bedrooms and a sleeper couch to accommodate 6 guests. Double French doors lead onto the veranda for outdoor dining next to the private plunge pool and braai area. From the pool the breathtaking view is down the valley and onto the impressive Cederberg Mountains. De Kom is gas operated and well appointed with fridge, geyser, and oven. Lamps and battery charged lamps provide lighting. This cottage’s romantic ambience is enhanced by its very remoteness and is ideal for guests who want to experience total privacy. 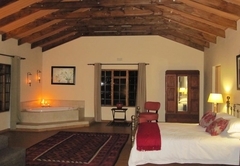 A kilometer from the farmhouse is our biggest self-catering cottage, ‘Die Veepos’, built in a Cape vernacular style. 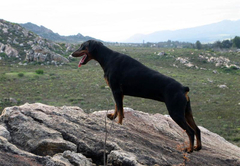 It is totally privately set in its own hidden valley amongst the sandstone outcrops and fynbos. It boasts three large bedrooms, a bathroom with shower and bath, lounge and kitchen. 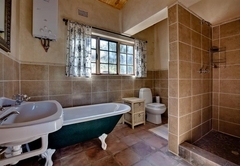 Outside on the stoep it has a plunge pool and under a nearby rock outcrop there is a shower to cool you off. ‘Die Veepos’ also has a romantic outside bathroom privately set in the bush! Guests can enjoy bathing in an old Victorian bath under the stars, champagne in hand! ‘Die Veepos’ is also gas operated for ambience and a green footprint. 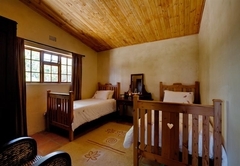 Inside the cottage is intimate and cozy with an open plan lay out which on the queen size brass bed. In the corner there is a raised double bath to be enjoyed by candlelight whilst enjoying the views down into the valley below. There is a separate bathroom for convenience and also a romantic Victorian bath in the veldt for a decadent way to end the day! The splash pool on the same level as the front veranda affords respite from the summer heat, the cool mountain breeze will ensure that guests sleep in absolute comfort.